INTERNALLY the property is in fantastic contemporary order throughout and comprises reception hallway, open plan kitchen and living space, double bedroom, luxury shower room, rear private patio and front lawned garden. A CAR PARKING SPACE right next door to the flat can sometimes be booked with the neighbours (subject to availability and extra cost) - please enquire with dates. THE FRONT GARDEN which is both East, South and West facing, and therefore sunny. This oasis has established plants and shrubs to give privacy when seated. It has a paved front pathway, plus a large expanse of super soft, artificial grass for fuss free maintenance and enjoyment. The SEATING consists of a bistro TABLE + CHAIRS (stored usually on your rear private patio, but easy to lift and move to the front garden). This is a wonderful space to catch some rays, have breakfast, lunch or tea in the sun, and perfect for entertaining during summer. An Open-Plan KITCHEN / DINER / LIVING ROOM (21’6 x 14’10 / 6.56m x 4.53m maximum) with two radiators, a central pendant light and recessed spotlighting. The Kitchen / Dining Area features a modern fitted kitchen comprising matching range of wall and base units, integrated stainless steel oven with a four ring gas hob with extractor hood over, and a stainless steel sink drainer unit with mixer tap. Appliances include Kettle, Toaster, Combination Microwave Oven, Washing Machine and a Fridge / Freezer. There is a circular dining table and 4 chairs, and a tiled floor. The Living Area is carpeted and has a high ceiling and two large bay windows facing East and South affording lots of natural light . Double glazed windows give views to the front garden and easy to operate white louvre shutters allow you total privacy inside, or just a touch of filtering if you prefer. Furniture comprises a 50” LED TV, router for Unlimited FREE WiFi, coffee table, 4x side tables and two 3-seater leather sofas (one of which easily converts to a Kingsize sofa bed). REAR PATIO GARDEN which is private and enclosed with artificial turf and bistro table and chairs. LOCATED at the junctions of Newtown Road + Hove Park Villas, the apartment is well served immediately across the road with a Chemists, Bakers/Coffee Shop, Convenience store, Hairdressers/Spa. Just over the FOOTBRIDGE to HOVE Railway Station are more shops inc a Tesco Metro, The Station pub, cafes, takeaways, coffee shops, newsagents, florist, car wash and petrol station. Keep fit at Snap Fitness Gym! SOUTH - A short walk brings you to Blatchington Road and George Street - Hove's main shopping district full of coffee shops, cafes, bars, restaurants, shops and supermarkets, including a large Tesco. One block further and you are on Hove seafront, with beach cafes and the King Alfred Leisure Centre. NORTH - If you head up Hove Park Villas, you reach Hove Recreation Ground and Hove Park in just a few minutes. They both have cafes and childrens' play areas. Nearby is a large Waitrose Superstore with free onsite car park. Please come and stay! You are very welcome to contact me with any specific questions. Born in Hove, so a local! Location and double aspect front garden plus rear patio. So close to all the things you need in Hove, and also so easy to get into Brighton whenever you want. Walk to many shops on doorstep. Contemporary Shower Room - Comprising matching white suite of low level WC, wall mounted wash hand basin with storage below and chrome mixer tap, shower cubicle with tiled walls, chrome heated towel rail. This is a wonderful apartment. Ground floor, very quiet and in a perfect location for commuting or enjoying all Hove has to offer. The best coffee in Sussex is a three minute walk away and there is a handy convenience store just across the road. The apartment is nicely furnished and very comfortable. The bedroom has a kingside bed and the bathroom is well appointed. A small but functional kitchen and plenty of seating. I will definitely stay here again! Great service from Simon. 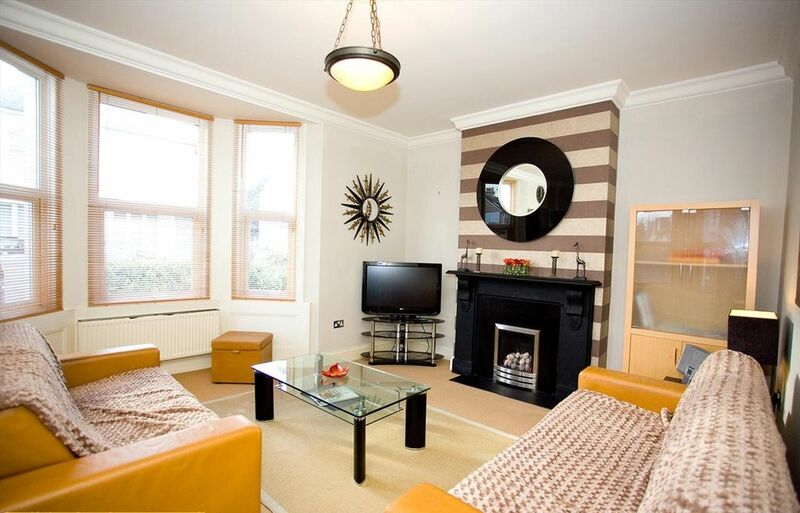 Quiet, clean, tastefully well appointed flat. Adequate kitchen and bath. Wonderful little private garden off the bedroom. Comfortable bedroom with ample closet space. Cozy living room. Good cable. Owner's rep is tremendous. Friendly, efficient, thorough orientation. Immediately responsive to our questions and needs. Less than a block from the Hove Train Station but we never hear the train. Excellent patisserie, and small grocery virtual outside the front door. Grocery, restaurants and more very nearby. I walk to the beach every morning just after dawn (10 minutes walk to the south) or the the South Downs 10 or 15 minutes to the North. Buses and trains to Brighton every 10 or 15 minutes. In short, We are very comfortable here for the entire month of September and gladly recommend to others who may be interested. Top review! Thanks so much for your comments. This one bedroom flat with front garden and rear patio is ideal, as specially my first stay was back in summer 2016, I used a lot a front garden during my stay, the garden is sunny most of the day and has been looked after well. Flat itself is lovely cosy, clean, with great kitchen build with lounge. I had lovely big bed, slept really good. I did use a rear patio as well which is right next to the bedroom. Superb bathroom, with nice step in shower. Location is great you can get pretty much everything, as there is shop, chemist .... cross the road, as well cross the bridge got a train station, which has been convenient for me. Appreciate your kind comments, thank you. I rented this lovely apartment for a 3 months period and can confirm that the apartment is as shown as on the pictures - even better as the shutters have been replaced by white wooden once which give even more privacy and look very nice. The furniture is tasteful and the price is a reasonable one given the fact that the apartment is huge (compared to any other on the market for the same price). Everything is well maintained, the rear patio is very private. No one can come or even look inside. I appreciated a lot the environment and most of all I enjoyed being in a calm and secure area very close to Hove station. And as a final plus: pharmacy, bakery and a small shop which is open 24 hours apparently is just a stone throw away. I highly recommend this apartment to everyone and need to admit being sad to leave. Wonderful feedback on the flat. Thanks for mentioning the shutters - they are a great improvement on the blinds, it's true. The privacy aspect is something we hadn't considered such a selling point before, but we will certainly mention it more now you have pointed it out. The Hove Station area is really doing nicely at the moment, with yet more cafes and bakeries opening up just across the footbridge, only a few minutes away. Hope to see you back again soon! I first rented this beautiful flat in April for a month when I moved to Hove with my work. When I first saw it, it felt like home and was beautifully decorated in warm, homely tones but with a clean contemporary twist. I then went on to rent it for a number of months as it has provided me with everything I need, great proximity to Hove Station, a secure parking space along with everything inside the flat to not have to worry about a thing! The living area is large, bright and spacious and is double aspect which provides lots of light. The bedroom also has a lovely private decking area which is particularly wonderful in the summer. With Sky TV and internet, and all the mod cons you need, this flat has been a wonderful home for well over 6 months. Simon at ApartmentCentre has been professional, accomodating and a pleasure to deal with. Thanks so much for making this home from home feel like I have been on a working holiday for many months! 5* recommendation! L'appartamento si trova in un'ottima zona, accanto alla stazione dei treni quindi comodissima anche per andare a Londra in giornata (circa 50 min di treno). Non serve la macchina perché c'è tutto vicino. Per quanto riguarda la casa, è molto carina solo che un po' piccola per una famiglia. Se la vacanza non è lunga va benissimo, perché per il resto è perfetta. Noi siamo stati 1 mese e 20 giorni e ci siamo trovati molto bene, andavamo spesso a Londra con il treno e tornavano la sera a dormire a casa visto che la stazione dista solo 2 min a piedi. Di fronte c'è una pasticceria , una farmacia e un piccolo minimarket. Molto utili, compravamo tutte le mattine i croissant freschi per la colazione. In generale siamo molto contenti della casa. Thank you for your positive review. Yes, as this is a 1 Bedroom Apartment, we do not promote or encourage the flat for families of 4, but we keep getting requests from people like yourselves who want to sleep 4 persons. We think the sofa bed is OK for a few nights, but not for a month long stay or longer. Our gain is where families are on a budget and find a 2 bedroom flat too expensive, so we get the enquiry. At the junctions of Newtown Road + Hove Park Villas, the apartment is well served just across the road with a Chemists, Bakers/Coffee Shop, Convenience store, Hairdressers/Spa. Just over the footbridge to HOVE Railway Station are more shops inc a Tesco Metro. A short walk SOUTH brings you to Blatchington Road and George Street - Hove's main shopping district full of coffee shops, cafes, restaurants, supermarkets and shops. One block further and you are on Hove seafront, with beach cafes and the King Alfred Leisure Centre. If you head NORTH up Hove Park Villas, you reach Hove Recreation Ground and Hove Park.